Randy Wayne White wrote the first ‘Hawker’ novel, “Florida Firefight”, in 1984 under the moniker Carl Ramm. White would later go on to achieve much bigger success with his 'Doc Ford' series. While the debut left a lot to be desired, the series drastically improved into a stylish private eye action formula. 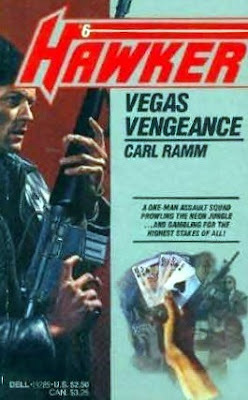 The sixth title, “Vegas Vengeance”, continues that trend. The book begins with Hawker making a phone call to Barbara Blaine. She owns a successful prostitute house on the strip aptly titled The Doll House. Through the conversation we learn that Hawker was tipped off about murder and extortion tactics leveraged against Blaine and her company. Blaine, concerned this is another crafty attempt to weaken her defenses, agrees to dinner after hearing Hawker's background. From there, the wheels are set into motion. Before Hawker can meet Blaine, he's met with a high-speed, high-octane shootout on a dirt road southwest of Vegas. It's Hawker in a Jaguar XKE convertible and the baddies sporting a Datsun 280Z. White holds nothing back as the two race through the canyon, all guns blazing until Hawker derails the Datsun's quest. These two guys know about Hawker's assignment and the protection he's ultimately offering Blaine. As a typical private-eye yarn...this one hits all cylinders. Hawker learns who's shaking down The Doll House and why. Through shootouts and an intricate investigation, Hawker tracks the enforcers to a mining camp. Before that there's the obligatory mattress romp in the dark with what the reader assumes is Blaine. That mystery remains until the last few pages, a nice touch that adds a little more depth to the saga. Overall, “Vegas Vengeance” is another well-told Hawker story. While easily infringing on many detective novels (this is the 80s) that came before it, there's still enough identity here to make this a winner. I can't stay away from these books and I've been storing them in the vaults hoping I don't run out of the series too quickly. If you need a light read...Hawker is it.